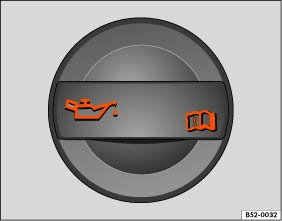 Park the vehicle on a level surface to ensure the engine oil reading is correct. Switch off the engine and wait a few minutes for the engine oil to flow back into the sump. The oil level can be checked immediately and oil refilled if the engine is cold. The engine oil filler opening bears the symbol on the cap and the oil dipstick has a coloured handle. Pull the dipstick out of the guide tube and wipe off with a clean cloth. Insert the oil dipstick in the guide tube again as far as it will go. If there is a marking on the oil dipstick, this marking must fit in the corresponding groove at the top end of the guide tube when inserting. Pull the dipstick out again and read off the engine oil level . After reading off the oil level, push the oil dipstick in the guide tube as far as it will go. Area Ⓐ Do not refill oil . Area Ⓑ Oil can be refilled (approx. 0.5 l). The engine oil level may be in area Ⓐ, but not above Ⓐ. Refill only small quantities of the engine oil in steps. Unscrew the engine oil filler opening cap from the cylinder head . If it is unclear where the cap is located, please contact a qualified workshop. Only the engine oil approved by Volkswagen expressly for this engine should be refilled in small quantities (no more than 0.5 l) . 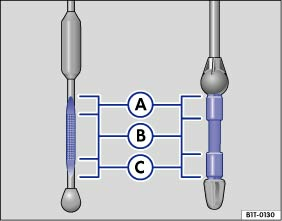 In order to avoid overfilling, you must wait after each refill step so the engine oil can flow into the oil sump up to the marking on the engine oil dipstick. Check the engine oil level before refilling with a small quantity of engine oil. Never overfill engine oil . If the engine oil level is at least in area , push the oil dipstick into the guide tube as far as it will go in order to prevent the engine oil from draining out when the engine is running. After refilling, screw the oil filler opening cap back on correctly. Engine oil can ignite if it comes into contact with hot engine components. It can cause serious fires, burns and other serious injuries. Always ensure that the cap of the engine filler opening is securely closed after refilling. This will prevent the engine oil from draining out on to hot engine components when the engine is running. Do not start the engine if the engine oil level is above area . Seek professional assistance. The catalytic converter and the engine could otherwise be damaged. When refilling or changing operating fluids please ensure that the fluids are in the correct container. Incorrect operating fluids can cause serious functional problems and create function errors and cause engine damage. The engine oil level must never be above area . Otherwise oil can be drawn in through the crankcase breather and escape into the atmosphere via the exhaust system.